This is a car that needs no introduction. The 2018 Honda Civic Type R roared into the States and immediately won hearts all over. This race-bred hot hatch marries turbocharged performance to the Civic’s famous practicality for a car that’s at home on the streets and dominates at the track. The 2018 Honda Civic Type R cuts an imposing figure at the track. With more aggressive lines and iconic red accents than its mild-mannered Civic siblings, the Type R makes a lasting impression. This car marries form and function: its sleek angles and aggressive grille make you faster and more aerodynamic. The 2018 Honda Civic Type R also features a few exclusive looks and options. Championship White paint is only available for the Type R, but you can also choose the fiery Rallye Red or imposing Crystal Black if you prefer. The iconic red H badge is a symbol of the Type R’s racing heritage, standing out on the bold black front end. There’s also an aggressively styled front bumper and LED headlights to make your entrance memorable. The Type R’s style is evident from every angle. Its versatile hatchback form stays true to the original Type R, and offers an immediately recognizable profile. From the nose to the rear wing, the Type R’s dramatic lines and angles reveal a swift and cutting-edge figure. As you blast off from the line, bystanders will be treated to the sight of the striking Rear Wing, the perfect balance of looks and aerodynamics. A fierce, bold exhaust note and bright LED brake lights make for a notable exit. The 2018 Honda Civic Type R comes with all kinds of features and technology for the perfect driving experience. Thorough calculations and meters are on display so that you can stay in tune with your car. Multiple driving modes, including +R, Sport, and Comfort, mean that the Type R is ready to perform perfectly in any situation, from a spin around town to a high-speed track lap. The Type R also lets you track your performance with customizable digital meters. You’ll be able to see your boost pressure, G-force, rev limit, and throttle/brake input in real time, and maximize your track performance. In addition to the track-oriented features, the Type R also has lots of standard goodies to make your drive more comfortable and more fun. A high-quality seven-inch display audio touchscreen infotainment center makes it easy to select your apps, music, navigation, and more. There’s also a booming 540-Watt 12-speaker premium sound system for your tunes. The Type R also lets you hook up your music library through Apple CarPlay and Android Auto. You’ll also be able to access your navigation, apps, text messages, and more. You’ll also find lots of features that keep you connected on the road. Not only does the 2018 Honda Civic Type R connect to your smartphone, it also comes with several smart features of its own. Honda’s satellite-linked navigation system gives you a high-tech, high-quality view of your directions and route. Your maps show 3D renderings of terrain, buildings, and road signs, and the system also provides lane guidance and a live search function. There’s also a standard multi-angle rearview camera to with guidelines and three different viewing angles. Finally, the HondaLink system lets you check on your Type R from your smartphone, and gives you easy access to check your fuel and range status, operate the remote engine start, lock or unlock the doors, and much more. The high-tech Type R has everything you need to stay connected to your car, on the track and out on the open road. The 2018 Honda Civic Type R is famous for its incredible race-driven performance. From its turbocharged powertrain to the aggressive aerodynamics of its design, this car was engineered to be fast and fierce. Under the hood, the 2.0L VTEC turbocharged engine is wrapped in iconic red cowling. It’s made with 70 years of distilled racetrack engineering to deliver 306 horsepower and 295 lb-ft of torque into your hands. The 2018 Honda Civic Type R also utilizes an incredible power-to-weight ratio. It’s built with a strong but lightweight chassis and an all-aluminum hood to reduce weight. This clever engineering makes the Type R swift and agile, perfect for overtaking the competition. The Type R also has standard 20-inch Black Alloy wheels, which help show off the large red Brembo front brake calipers. You also get tight, precise cornering thanks to a limited slip differential, built to give you confidence and fun with your driving experience. The Type R’s body design also uses several features to increase your aerodynamics. A front splitter helps underbody airflow to generate downforce and give you better steering control. Also at the front, your Type R has front air curtains to contribute to a consistent braking performance. The vented front fenders also help pull out turbulent air around the tires to reduce drag. They’re built to accommodate the widened tire stance, and they help give you predictable, excellent handling. Your Civic Type R is built to go fast, and that includes the functional side skirts that help with downforce and provide stability at high speeds. At the rear, the Type R has Vortex Generators above the back window to channel air toward the Rear Wing. The wing itself is positioned at almost roof height to give you optimal downforce. Meanwhile, the rear diffuser deduces drag at high speeds. All of these body engineering feats help give you a confident high-speed track machine. Three driving modes let you pick the perfect balance for your driving situation. The 2018 Honda Civic Type R can retune your suspension, adjust your throttle response, and even change the steering settings according to the mode you select. With +R, Sport, and Comfort modes, you can select the optimal response from your Type R. This gives you more freedom to set your own pace and get the best driving experience every time you take the wheel. No matter which mode you’re in, the Adaptive Damper System actively controls your suspension action to give you the best response, from smooth cruising to race-tuned stability. Each 2018 Honda Civic Type R is one of a kind, and you’ll find little reminders of its individuality throughout the interior. Every Type R has a unique serial number displayed on a metal plaque beneath the aluminum shift knob. The cabin also features race-ready lightweight bucket seats up front, decked out in red and black suede-effect fabric. These bucket seats are both steadying and comfortable, ready to keep you in place during hard cornering yet also comfortable enough for daily drives. You also get Honda’s race-inspired Sport Pedals, with extra grip and texture for quick heel-and-toe movements. The leather-wrapped flat-bottomed steering wheel also provides the necessary feeling and grip to tackle hard turns, and gives the cabin more red-on-black class. Apart from its race-inspired goodies, the Type R shares its interior layout with the classic Civic hatchback. It benefits from the familiar layout’s well-built quality and ergonomic excellence. You’ll find the aluminum shift knob falls easily to hand, and there are plenty of cupholders and cubby storage within reach. It also benefits from the interior versatility of any hatchback. It’s highly practical, and it’s a breeze to load up the Type R on the occasion you need more cargo space than track speed. Luckily, this model offers both! You can easily stow luggage or equipment with all the seats upright. Plus, the Type R features 60/40 split-folding rear seats, so you can easily fold the rear seats down for 46 cubic feet of cargo space. To keep the 2018 Honda Civic Type R a lean, mean, racing machine, Honda chose not to offer heavy driver-assist technology like Honda Sensing on this model. However, the Type R is built to keep you safe on the track as well as on the street. It’s full of passive safety features like an advanced airbag system with rollover sensors. It also benefits from Honda’s ACE body structure to protect you and your passengers. The Type R includes several active safety features, too. The standard multi-angle rearview camera features dynamic guidelines to help you reverse safely and easily. You’ll also get the confidence of Honda’s vehicle stability assist with traction control, as well as an antilock braking system. There’s also brake assist and electronic brake distribution to give you a hand in hard-braking situations. It also scored excellent safety scores in the NHTSA** tests. The 2018 Honda Civic Type R only comes in a single race-ready trim. You’ll get the VTEC turbocharged engine and slick six-speed manual transmission to power you around the track. It also comes with all the standard features mentioned above, plus all of the comforts and amenities you expect from a Honda. Features like cruise control, dual-zone automatic climate control, and a 12-volt power outlet are given. There’s no extra package to add on to get the sport pedals and flat-bottomed steering wheel; it’s all part of the iconic Civic Type R from the get-go. 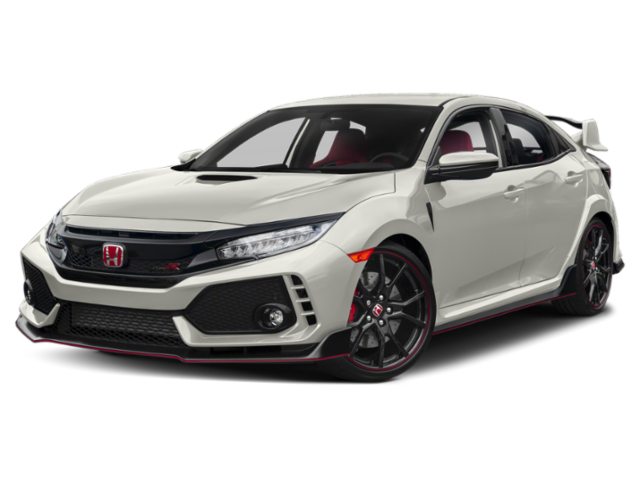 Need help choosing the right 2017 Honda Civic Type R? The 2018 Honda Civic Type R comes with a great warranty package, listed below, that will ensure your car’s protection for many years. All new Honda vehicles are covered by both a Limited Vehicle Warranty, and a Powertrain Limited Warranty. All Honda Genuine Accessories that are installed at the time of a new vehicle purchase are also covered for 3 years or 36,000 miles. Honda Genuine Parts are covered for 1 year which includes parts replacement and labor. 24-hour emergency road service is also available during the 3-year/36,000-Mile Limited Warranty. It includes jump-starting, flat tire and lockout assistance, towing, and more. *Honda Care is available to add to your new 2018 Honda Civic Type R. However, if you are a Buerkle Rewards Plus member, every new or and used vehicle purchase also comes with two free oil changes, two free tire rotations, 5% back on service and parts purchases, and much more, so make sure to check it out! If you’d like to learn more about the awesome 2018 Honda Civic Type R, feel free to stop by and visit us near St. Paul, MN! Our friendly, knowledgeable team is always happy to talk about what you’re looking for in your new Honda. We’re here to help you find the perfect car for all of your needs, whether that’s a sporty hot hatch or a sturdy family SUV. Remember, when you purchase a new Honda with us, you’re eligible for a Buerkle Rewards Plus membership. You’ll earn things like free car washes, two free oil changes, $200 off of your next vehicle purchase, and much more! Give us a call when you’re ready to stop in for a test drive. We look forward to seeing you! *22 city/28 highway/25 combined mpg rating for Civic Type R with 6-speed manual transmission. Based on 2018 EPA mileage ratings. Use for comparison purposes only. Your mileage will vary depending on how you drive and maintain your vehicle, driving conditions and other factors.